Florencia Marcucci*, Veronica Murcia-Belmonte*, Qing Wang, Yaiza Coca, Susana Ferreiro-Galve, Takaaki Kuwajima, Sania Khalid, M. Elizabeth Ross, Carol Mason#, Eloisa Herrera#. Mason C.,Marcucci F.,Murcia-Belmonte V.,Herrera E.,Coca Y. The retina of lower vertebrates grows continuously by integrating new neurons generated from progenitors in the ciliary margin zone (CMZ). Whether the mammalian CMZ provides the neural retina with retinal cells is controversial. Live imaging of embryonic retina expressing eGFP in the CMZ shows that cells migrate laterally from the CMZ to the neural retina where differentiated retinal ganglion cells (RGCs) reside. Because Cyclin D2, a cell-cycle regulator, is enriched in ventral CMZ, we analyzed Cyclin D2−/− mice to test whether the CMZ is a source of retinal cells. Neurogenesis is diminished in Cyclin D2 mutants, leading to a reduction of RGCs in the ventral retina. In line with these findings, in the albino retina, the decreased production of ipsilateral RGCs is correlated with fewer Cyclin D2+ cells. Together, these results implicate the mammalian CMZ as a neurogenic site that produces RGCs and whose proper generation depends on Cyclin D2 activity. 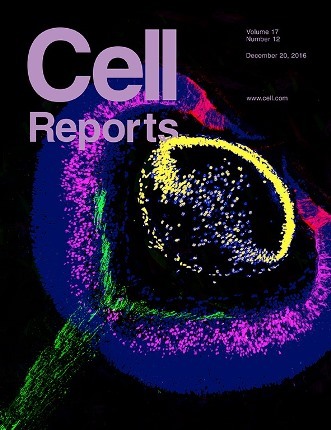 On the cover: The ciliary margin zone (CMZ) of the mammalian retina generates retinal ganglion cells (RGCs) during embryogenesis. In this issue, Marcucci et al. show that cells migrate laterally from the CMZ (red) to the neural retina, where differentiated RGCs (pink) reside. Genetic perturbations of the CMZ, e.g., ablation of the cell cycle regulator Cyclin D2, reduce the output of RGCs from this niche. RGC axons are shown in green, and lens cells are shown in yellow.